Dewber has the potential to change the loyalty program industry for good. Market leaders like Dewber are shaping the blockchain loyalty market. But, what exactly does the future hold in this space? The future looks bright and is filled with optimism about the potential gains. As envisioned the blockchain is of great value to loyalty programs. Let us now look into the potential benefits this ideation brings. Traditional loyalty programs offer you points. And the store decides what to provide you with. It might offer an extra good that you might not need. And of course, it is not convenient enough. But with blockchain based loyalty programs, the store will credit your account with tokens. The blockchain will give you more freedom. You will have rights to transfer, trade and store your tokens within the blockchain. The blockchain loyalty system converts the rights to loyalty points into tokens. So, the loyalty points due to you are switched to their digital representation on the blockchain. Blockchain loyalty programs guarantee good levels of security. Thus, with smart contracts, the loyalty programs report and track transparent transactions. So, the associated costs in fraud and errors are limited. The blockchain will replace legacy and database systems and thus reducing IT-related infrastructure costs. Traditional loyalty programs exist on intermediaries. But the blockchain loyalty programs will reduce intermediaries that expect payment for relaying transactions. Another issue is the dispute resolution. Smart contracts within the blockchain will limit costs of contract and payment disputes thus allow for a seamless transaction process as automatic payments for preset conditions will be triggered. All the benefits will be beneficial for both the business and customers. As a customer, you want a quick business. Even more, new customers would wish for prompt trading as they have short attention spans. With blockchain loyalty systems, processing of information is near real time. Also, with blockchain, the loyalty programs will gain massively on security. Though with the blockchain having its risks, it promises hack-proof abilities. So, creators of these programs like Dewber will work to prevent blockchain manipulation or abuse. Traditional loyalty programs credit a customer with points. Until these points get to a set level or a timed promotion by the store is reached, they cannot be redeemed. Now, blockchain loyalty programs will enable you to earn tokens from purchases and redeem your tokens instantly. Almost the main reason for the existence of the blockchain, blockchain loyalty programs will control what, and the amount of information stores can access. Simply put, you will be privileged to limit what information the stores can access of you. Having administrator rights on our data is all we want. Furthermore, retailers are using it for commercial use. We all want our privacy. Having the control on what information stores can use is a plus for blockchain loyalty programs. With Dewber, the creators want your tokens to have a market value that can stand the test of time. Some points have some expiry forcing their use within specific promotions. Any store or business with a loyalty program has its system with a card. Several cards with no consolidation of the points can result into some expiring before they are redeemed. And they are limited to the specific store`s procedures. But with Dewber, your points will have constant value and not expire even after store promotions. Furthermore, Dewber will be cardless. Since the token has a market value, it will exist for you to use in the future. It is like having money, and we know money does not expire. We are global citizens. Our movement is not restricted. So, will the blockchain loyalty programs. You will earn tokens on vacations and redeem them wherever you will be. Besides, you will be able to receive offers from retailers in other countries. Going to France or any country for a shopping adventure will earn you points. Dewber will turn these points into tokens. And you will access them even if you go back to your country. We have seen the benefits tokenization offers. The blockchain loyalty programs will convert your loyalty points to tokens. Consequentially, the system will allow spreading the tokens into areas like online reviews, e-commerce, theater, and amusement parks. Imagine taking a shave and earning tokens. Soon, every retailer or business will have the desire to have their loyalty program. So, then there is an opportunity with Dewber to have a blockchain that works for you. 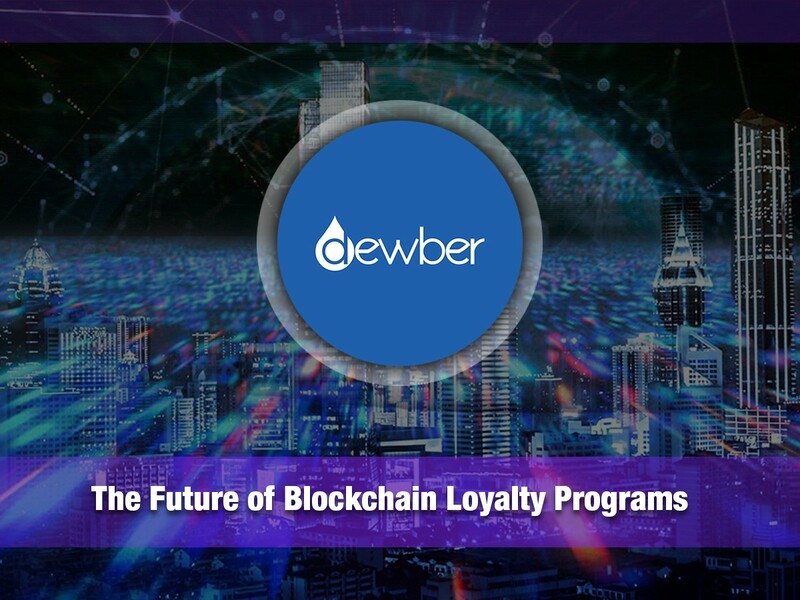 Dewber enables cross-channel redemption by rewarding loyalty points which can be earned and redeemed at any store or business within the Dewber loyalty ecosystem. Blockchain has reinvented the way you will access your tokens. It is cardless. Picture yourself using your smartphone to scan some code. For instance, you will scan a QR code created by the retailer and tokens will be credited to your account. Even further there will be targeted marketing with individual offers. Upon redemption, tokens are transferred to the retailers. For that reason, brands can also reward retailers for successful sales. The future of blockchain in the loyalty economy is here with us. We can walk with it into the future or wait for surprises and regrets. Dewber has come out to make it easy for you to earn loyalty points. Also, with the benefits surrounding blockchain loyalty programs, the points will have way more value than traditional loyalty points. Become a part of this loyalty token revolution.